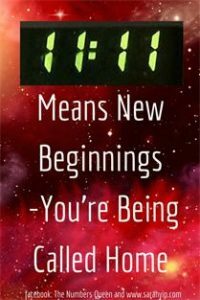 Home11:1111:11 Podcast with SisterFriend Marie – Why Sceptics See Repeating Numbers On Clocks! I love instant manifestation. Last week, I spoke to my coach Susanne King* about podcasting. That same day, I was invited to a podcast with Marie D. McCohnell (SisterFriend Marie). Clearly, the Angels were listening! *I met Susanne through Basic Bananas. Not only does she see 11:11, she works for Tony Robbins, a famous 29/11 lifepath. I’d love to read his hands. Sarah: Hi, I’m a numerologist from Australia. I specialise in working with people who see number sequences, particularly 11:11. A lot see triple numbers like 111, 222, 333 and some see palindromes. It’s a fascinating topic. I have a lot of people in the United States who experience this phenomenon. Marie: (mentions that she has been seeing sequences for years – that’s her to the right) In your research, could you explain why we wake up at certain times and what that means? Sarah: I can give my impression, but it’s not the only theory. Having studied a few thousand people, they have a lot in common. Many have Master Number 11, Master Number 22 orMaster Number 33 in their numerology, for example it’s the sum of their date of birth (called a lifepath – find your lifepath) or it’s in their charts. (Note: I believe most of these people are Starseeds). This suggests they have double responsibility – they want to do twice as much in one lifetime. They start seeing numbers when they are beginning a new chapter or need to step up (find your personal year – number sightings tend to increase in frequency at the start or end of a 9 year cycle). People who have 11 numerology often see a lot of 11:11. It’s some kind of calling card from their soul. I’ve also noticed that people who see numbers have a lot in common. They get along, it’s almost as if they’ve known each other from previous lives. They are often sceptics or people who need visual proof of Spirit, that’s beyond normal symbols like animals, feathers etc. Numbers are very factual and we’ve been trained to respect them. My background is science, so it was very challenging for me to see numbers all the time. In the beginning, I thought I was going crazy, which is quite common. But after doing some research, you realise that what you’re seeing is the truth – and it’s beautiful! (Seeing numbers) leads you to the conclusion that everything is a miracle and there is a Divine Order. It’s quite an amazing thing to be involved in. I can’t believe I ended up here to be honest. Marie: When you first began to notice numbers…between astrology and all of that, are you saying that, where we like to think things happen by accident there is actually a distinct system implanted in our existence…That the Soul speaks through numbers and symbols as in sacred geometry?Would you say that things are very mathematically motivated? If we were going to talk about God as the greatest mathematician scientists have ever seen…? Sarah: It (maths) is a language that humans accept. I’m sure there are other ways that Spirit can communicate it. We so want to box things and measure them, especially the sceptics, Very frequently, the people who see 11:11 have normal lives and it’s almost like they’ve have been implanted into conservative families and lifestyles. When they see numbers, they have to go from one extreme to another, such as me going from science to becoming a psychic,and in doing so, they transform the people who know them,because it shows you that anything is possible. It’s just a beginning. It starts with the numbers, and if you follow it right through, the ultimate conclusion is that we are Souls, there arepast lives, we have soul groups. But not everyone gets to that point because they don’t always look for the answers. That’s why the internet is so great, because otherwise I would have missed it (the significance of 11:11), like most people. Marie: Don’t you think…the internet superhighway has come around at the perfect time? Even though we have found ancient computer parts, so we might be in a time loop here (chuckles). I have woke in the morning and seeing…sacred patterns in my room, and strings of numbers, much like the ones that appear at the end of The Matrix movie. You can change the numbers you see. You can turn them on and off. They aren’t just a one way street. It’s a new relationship with Spirit. They use the numbers to make initial contact. Marie: When you say change them, are you saying you can ask for the numbers to change, or does that happen naturally? Sarah: Yes, you can assign numbers to be codes for go ahead, stop, slow down. It’s just a way to get started on your journey of trusting your Spirit. That said, I believe certain codes are fixed, such as the 11:11 and the triples. They seem to be sacred in various cultures. The 11:11 seems to appear to a group of people who are experiencing Ascension symptoms (mentioned in this overview – you can also google Ascension). These are a group of people who are often in distress – they feel they cannot continue their lives as they have. The 11:11 is meant to get them researching, and connecting with people in the same boat. Marie: What is the most important code? Sarah: Based on the research I’ve seen, the 11:11 is the most popular one used. They’re all important. If you see triples (111, 222, 333, 444, 555, 666, 777, 888, 999), that could mean Guardian Angels, or a chakra that needs healing, for example 1 is the Root Chakra, 2 is the Sacral Chakra (see my Find Your Lifepath page). The 11:11 is the most commonly sighted one. Some people believe it’s a DNA activation code (e.g. Alexis Cartwright, also a 29/11 lifepath and a colleague in the industry). Others believe it represents parallel universes (I also see it as evidence your Third Eye Chakra is opening – read more). That’s the one people seem to remember, but they’re all exquisite in their own way. Marie: Scientists are talking about this being a holographic Universe (see video)…some noted physicists are saying they are seeing numbers in everything. Is this…some great quantum equation that we are all a part of? Once you going into Fibonacci numbers…with 11:11, is it related to the God Code? Sarah: Could you give me more information? Marie: It’s a new theory that there are…codes that are embedded into existence. I will pull up some information on it – there is a book by Gregg Braden. Sarah: I have heard of this – I just haven’t read the book yet. I’ve actually only been doing numerology in the past five years…I’ve done a lot of relearning in that period, it’s what I’ve devoted my life to it. There are still holes in my understanding. What I suggest is, some people say the Universe is made of sound of frequency. I’m a musician, so you could say that you represent sound, frequency or energy through letters or numbers. It feels like numbers are a clumsy way to describe the Universe, but they are also neat and easy to remember. Again, people who are sceptical, believe in them more. Maybe you could just say that (numerology and sequences) are a representation of sound or frequency. In the big picture, I know you have to get on the road in a few minutes. Can you let people know your details? Sarah: I actually have to catch a helicopter! My website is www.sarahyip.com and I am on facebook as The Numbers Queen. I have a lot of people on that page from around the world who see numbers and are interested in their meanings. If you know you have Master Number 11, 22 or 33, also see my facebook page Lifepath 11. There are about 120 articles on my blog, I’d encourage you to see my 11:11 ones as a starting point. It’s only one theory, but it’s based on talking to lots of people. It’s a call home, to remember who you are, (seeing numbers) is only a small piece of the puzzle. Thank you Marie. Marie: We love you much and thank you for being with us. Afterword from Sarah: After my helicopter joy ride (see photos), which was a gift from a dear friend Helen, I returned to the office to read for a client who, get this, always wanted to be a chopper pilot. She laughed when I told her why I had helmet hair. I couldn’t believe the synchronicity! Or maybe I can…see my articles on a day in the life of The Numbers Queen. I hope you’ve enjoyed this new interview on11:11 and why you see number sequences on clocks, licence plates, receipts, etc. It’s not an accident! !